This exhibition, which spans Anthony Hernandez’ career of over 45 years and is comprised of 114 photographs, is open to the public until 12 May in the exhibition hall on Bárbara de Braganza, 13 (Madrid). Fundación MAPFRE has inaugurated in Madrid, the first Spanish exhibition of Anthony Hernandez (Los Angeles, 1947), which takes us on an extensive tour of the photographer’s long and prolific career and celebrates his personal style of street photography and the development of his work over time. Anthony Hernandez was born and raised in Los Angeles. Initially unaware of traditional forms of photography and basically self-taught, he developed his own unique way of understanding street photography, closely connected to the peculiarity of his home town, the stark scenes and the growing sprawl of asphalt and cement. Throughout his career, Hernandez skillfully moved from black and white to color photography, from 35 mm to large format cameras and from the human figure to landscapes and details verging on the abstract, thus giving rise to an unusually varied oeuvre revealing common features such as breathtaking formal beauty and a subtle engagement with contemporary issues. This retrospective, which covers over 45 years of Anthony Hernandez’ career, is comprised of 114 photographs organized into themes, which also follow a chronological order. There are, however, certain exceptions to this, thereby demonstrating how recurring visual motifs appear in several different series over the years. The exhibition begins with the Street Photography section, where we can observe his first works on the streets of Los Angeles, shot with a Nikon 35mm. With this first work he follows the great American tradition of street photography, led by photographers such as Robert Frank, Garry Winogrand and Lee Friedlander, whose work he barely knew at that time. In 1984, Hernandez has his first foray into color photography. These pictures, grouped into the Rodeo Drive series, were a turning point in his career, since he had decided to stop taking black and white photographs and given that this was his last series featuring the human figure. The exhibition continues with The city as a theme, where the originality of Hernandez’s street photography can be truly appreciated. These images treat the city not merely as a setting but also as a topic in and of itself. 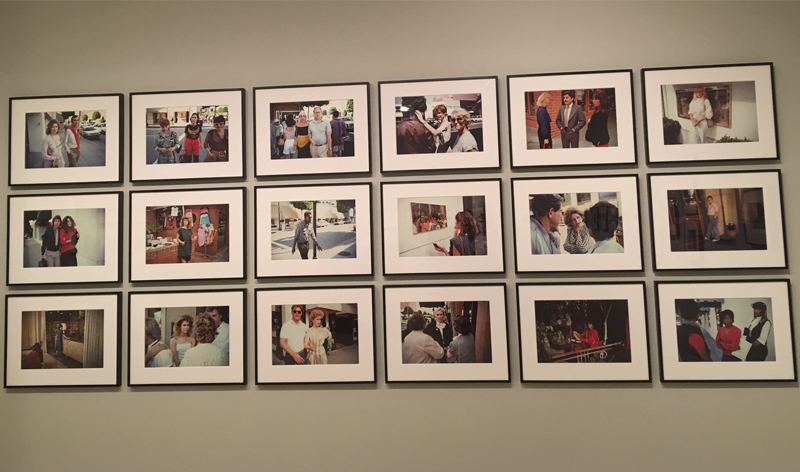 In this section we come across four series taken between 1978 and 1982, Automotive Landscapes, Public transit areas, Public fishing areas and Public use areas. Snapshots that not only capture the visual richness of southern California but that also pinpoint the class differences in society. The exhibition continues with Absence and presence, a section which houses the Shooting sites and Landscapes for the homeless series, photographs in which the human figure can only be perceived through the trail they leave behind and also with the Urban Ruins section, which focuses on his exploration of visually interlinking themes which he has continually returned to since the end of the Nineties. brick walls, fences, windows and holes of different shapes and sizes. These works bring us into contact with the more conceptual side of Hernandez, often associated with contemporary art, with compositions that reveal the profound influence that minimalism and movement have had on his photography Light and Space. The series Everything and Forever are featured in the Signs and traces section. These are pictures which involve Hernandez returning to the banks of the river where he played as a young child and where he now finds only a garbage dump and a very distant and isolated world. There are also pictures taken in the homeless people’s camps, where he photographed what the people living there could see from their makeshift settlements. The Discarded section gathers together pictures shot from 2012 to 2015, taken in desert communities to the east of Los Angeles during the worst years of the last financial crisis and the wave of evictions. The photographer combines landscapes, still lifes, interiors and some portraits. The exhibition comes to a close with Screened Pictures, photographs corresponding to his most recent set of work. The photographer returns to Los Angeles and focuses his camera on the punctured metal panels of the bus stops. Unlike his Public Transit Areas series, in which the city appears to spread out endlessly, in Screened Pictures space is flattened out and squeezed. Moreover, the chaotic details of those bus stop photographs in black and white have disappeared and are now replaced by soft and simplified shapes, and blotches of vivid colors. This exhibition has been organized by the San Francisco Museum of Modern Art (SFMOMA), an institution with whom Fundación MAPFRE has been collaborating since 2015, when they presented the Garry Winogrand exhibition in their Madrid Exhibition halls. The Fundación MAPFRE Brassaï exhibition is currently on display in the SFMOMA exhibition halls, and is open to the public until 17 February 2019. The curator of the exhibition, Erin O’Toole, the director of the Fundación MAPFRE Culture Area, Nadia Arroyo Arce, and Anthony Hernandez himself took part in the press conference.